Question: Where is LBNL located? 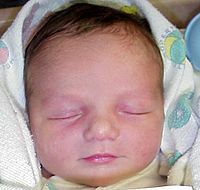 Philip waited to be born until after the 2000 edition of the Review of Particle Physics, the Particle Data Booklet, the Pocket Diary, and the Web edition were completed for the year 2000! A picture (left) of me on Lookout Rock, off the Pacific Crest Trail!! Another picture (right) of me on the Pacific Crest Trail -- at about 6000 feet (look at it winding in the background. We picked up the trail a little southwest of Quincy California in the Plumas National Forest, near Buck's Lake. Question: If I got up to the snow level at 6200 feet, where did I start? Answer: No, not at 6000 feet! Actually at about 5200 feet! Walked a total of 2 1/2 miles. Don Groom (here is a picture) designed a Cork Model. Enjoy our new feature: The Particle Adventure: An interactive tour of the inner workings of the atom and the tools for discovery. 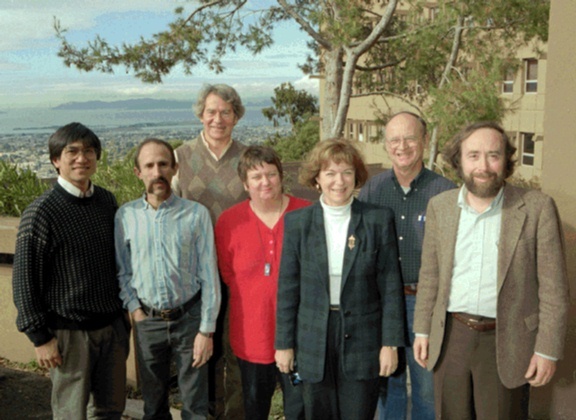 This is a picture taken in January 1995 of the Particle Data Group at Lawrence Berkeley National Lab. Pictured, left to right, are Paul Gee, Gary Wagman, Tom Trippe (in back), Betty Armstrong, Gail Harper, Don Groom, and Michael Barnett (group leader). Missing is Charles Wohl (retired). In the background are the cities of Berkeley and Albany and the San Francisco Bay. Angel Island and the Marin Hills are visible behind Tom. The tree is not a Monterey pine. Question: what is the name of the Bridge behind (and to the left) of Paul Gee? 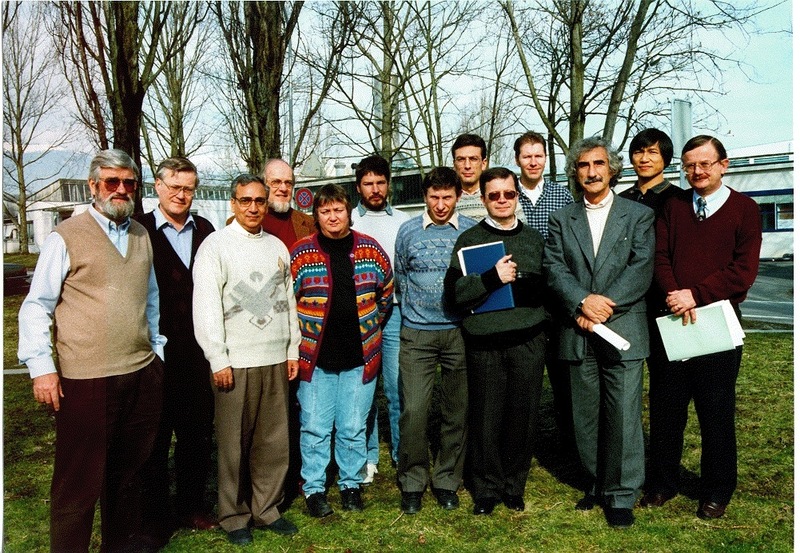 This is a picture taken at CERN in February 1996 during the Meson Meeting of the Particle Data Group. Pictured, left to right, are Fred James (CERN), Nils Törnqvist (Helsinki), Atul Gurtu (Tata Inst. ), Matts Roos (Helsinki), Betty Armstrong (LBNL), Klaus Mönig (CERN), Simon Eidelman (Budker Institute of Nuclear Physics, Novosibirsk), JuanJo Hernandez (Universitat de Valencia), Manuel Aguilar-Benitez (C.I.E.M.A.T., Madrid), Andy Hicks (CERN), Carlo Caso (Universita di Genova), Paul Gee (LBNL), and Claude Amsler (Univ. of Zürich). Visit my family and friends page. List of phone numbers and email address.